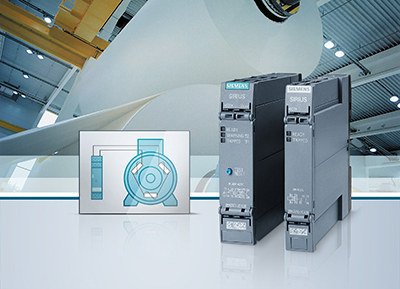 Siemens is bringing a new product family of thermistor motor protection relays onto the market. The Sirius 3RN2 replaces the preceding 3RN1 series, and with widths of only 17.5 and 22.5 millimeters these relays require less space in a control cabinet. A standardized wide-range supply voltage reduces the number of versions. With just one device, machine manufacturers and users cover all supply voltages throughout the world. Sirius 3RN2 thermistor motor protection relays reliably protect motors against overheating by measuring the temperatures at points at risk of overheating within the motor. PTC (positive temperature coefficient) temperature sensors are integrated into the motor windings to monitor critical overheating. Right from the start, the Atex versions of the new generation of Sirius 3RN2 thermistor motor protection relays were developed with the focus on functional safety. Verification of their suitability for SIL 1 applications fulfills an important requirement of DIN EN 50495. The verification of suitability for Atex is valid for both gas-laden and dust-laden atmospheres. This makes production safe for machine manufacturers and users, even under difficult conditions, such as those found in the oil, gas and chemical industries, and in mills and sawmills. For more information, go to: www.siemens.com/sirius.